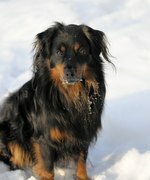 What Causes Hair to Grow in a Dog's Mouth? Dogs' mouths are notoriously strange and slimy places, but most people don't expect to find hair sprouting from them. If your dog has ever opened his mouth to reveal his tongue covered in hairlike growths, you've probably wondered what they are and what could be causing them. Although you should seek a veterinarian's advice if these hairs become more abundant or abnormal, you might be able to determine on your own what is causing them. Tufts of what seem to be black hairs on your dog's tongue are symptomatic of a condition called, appropriately, black hairy tongue. It results from too much yeast or bacterial growth in the mouth. These growths build up on the taste buds, or papillae, creating a hairy appearance. The papillae can grow to 15 times their normal length, causing them to look hairlike. What Causes the "Hair" to Grow? Certain factors may increase the amount of yeast or bacteria in a dog's mouth. Feeding your dog human food may be the cause, because different yeasts and bacteria are found in human food than are found in dog food. If your dog has recently undergone radiation therapy to treat cancer or a tumor, this could be the cause. Medications, such as antibiotics, that disrupt the normal balance of bacteria in the mouth can also result in hairy tongue. A dehydrated dog, or one who is not producing enough saliva, is also at risk. If the hair runs in a line down the center of the dog's tongue, this may be a different condition, called heterotopia, in which hairs do grow on the tongue. No cause is known for this rare condition, which should be addressed by a veterinarian. Proper oral care for your dog can help prevent black hairy tongue. Brush your dog's teeth, tongue and gums as often as possible. Toothbrushes and toothpastes specially formulated for dogs can be purchased at pet supply stores. Ask the salesperson which toothpaste is best for your dog's breed.